Happy Feet Soccer League from Blue Bird Studio on Vimeo. The Sunday HappyFeet League runs from October- May. This league will build your child's individual soccer skill, enhance familiarity with the ball & empower their self-concept! With soccer moves such as pull-backs, steps-overs, L-turns & more being introduced and incorporated each league registration. 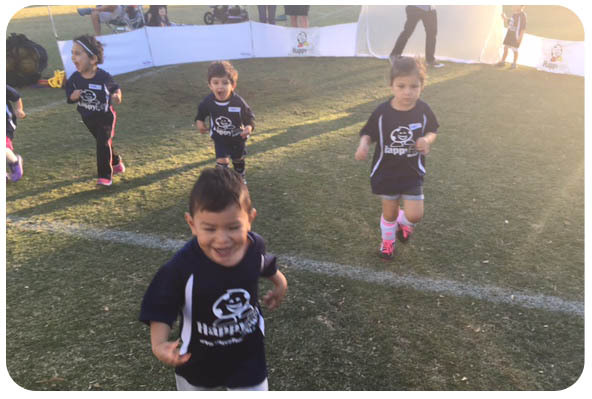 This league contains all the elments & fundementals of the HappyFeet curriclum to help further advance your child's soccer skill as they progress from the Little Toes Program all the way through to the HappyFeet Advanced Program. We continue to use our creative imagination while taking Bob the Bobcat (the name of our soccer ball) on adventures through the jungle, the enchanted forest, to the ocean or even outer space all while mixing in dynamic soccer moves and pumping up their self-esteem each week!!! And of course, everything is age appropriate and conducted in a comfortable Family FUN environment to ensure that all children not only have fun, but also learn many kinds of soccer skills along the way! This is a great time for parents and even grandparents to come together and live the FUN as much as our little friends do!! Each session begins with skill introduction training and is then followed by a non-competitive/ competitive soccer game. The session structure and included components progress from Little-Toes for 2's to HappyFeet Advanced for 4's, 5's & 6's in a way that maximizes skill development while ensuring that all children are allowed to develop and excel at their own pace. Each session is 50 minutes in length and consists of a 15- 30 minute HappyFeet practice directly followed by a game. Little Toes for 2's is 45 minutes of songs, games and adventures with a soccer ball. 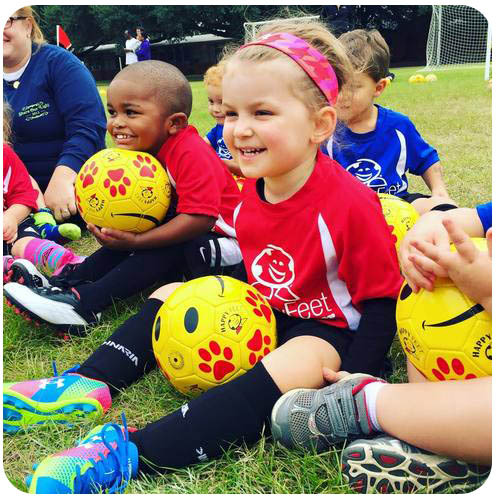 Big Toes for 3's: Each session includes 30 minutes of "storytime with a soccer ball" training that includes games focused on the skill of the week followed by a 15-20 minute non-competitive game. A progression from the Little Toes program, Big Toes participants learn much of the same elements as Little Toes but with a slightly more advanced approach. HappyFeet for 4's/ 5's & 6's: Our flagship program designed for boys & girls ages 4-6. 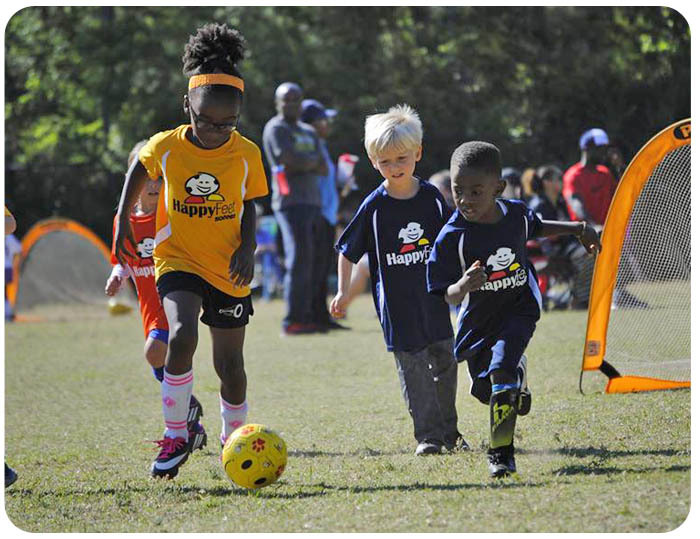 Your little soccer star will participate in a team setting with their HappyFeet Coach. The HappyFeet philosophy is to ensure above all else, we provide a FUN, FAMILY FILLED, NURTURING environment allowing ALL children to have a positive experience. Each session includes a 15-20 minute training warm-up that includes the skill of the week and will be followed by 25-30 minutes of competitive league play!